This content is provided by Robert Thomas. 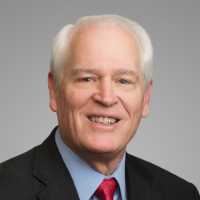 Bob Thomas is a partner and co-chair of the Energy Transactions section at Porter Hedges. His practice principally consists of the representation of domestic and international oil and gas companies in all phases of the energy business with emphasis on the upstream and midstream segments of the industry. In addition, his practice includes representation of energy companies involved in complex energy cases, whether mediation, arbitration or litigation. Prior to joining Porter Hedges, Mr. Thomas was Division Attorney for Mesa Petroleum Co. in Houston, Texas and in-house counsel for Gulf Oil Corporation in Midland, Texas and New Orleans, Louisiana.